Back last Tuesday I had my monthly get-together with the Towners. I suggested Zupas so that was where we went. My second time there, and I chose the mushroom bisque for my soup and instantly acquired a new 'addiction.' It was amazing! We all had a great time there, and I wish my mom had been along to see the various flavors of creme brulee they had for dessert. Mary and I behaved, but Joe got the creme brulee cheesecake. On Thursday at work my boss did a pancake breakfast (though her husband actually make all the pancakes!). The motive was to have a taste test between Costco pure maple syrup, and the maple syrup she had purchased when she was up in Vancouver. We all quite enjoyed the pancakes and fruit...and the taste test came up a tie! On Friday I used part of my lunch break to walk over to the new Walgreens. It is at least double the size of the old run-down one, and even better, it is now accessible entirely by skyway, which will be a big blessing if/when the weather gets too bad for my to walk to my usual food shopping place. It was far from cheap, but I'm glad I splurged for the higher-quality paper cutter to trim the single-page calendars I'd ordered. I am really, really impressed by the design and the quality and how tiny a strip a paper I can shave off, how clean the cuts--the whole deal. So while this year got a bit pricey with the calendar project, at least I'll have it for upcoming projects. Yesterday I did the revising I needed for 'Deceptions,' so hopefully I will be able to review it a few more times and be done with it soon. Today is a special day, as it brings me to just two months left before my 25th anniversary of 'meeting' t'DoL. 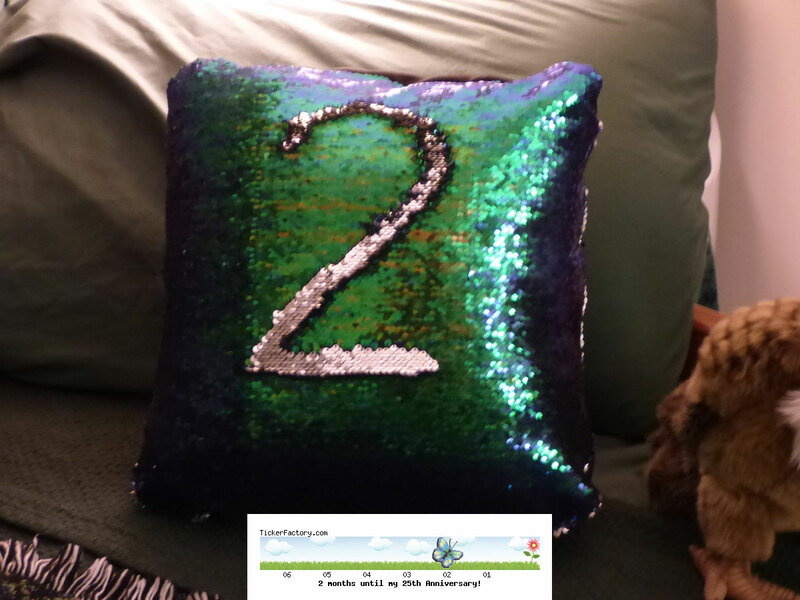 I may have to switch my mermaid pillow to a day-by-day countdown soon! You did get together with the Towners on Tuesday. You are getting see them a lot his month. Is Zupas downtown and what kind of food? Yes indeed, and again on Christmas! =) Did you get to call Mary? No, Cafe Zupas is a sandwich, salad, and soup place (rather like Panera) that Cindy introduced me to, and when I found out there's one in my area that just opened I recommended it to the Towners. Since it's right by Hobby Lobby I will have to get back over there.